Hello, everyone! I’m Jennifer from Catholic Inspired. My husband, Jonathan, and I will be interviewing one blogger each month here on CBN! 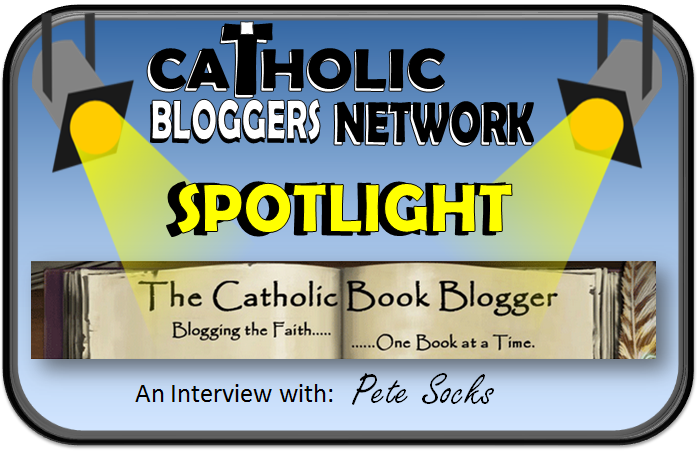 We have decided to do these interviews in the order in which they have been given to us and so today, for our very first post, we are interviewing Pete Socks from “The Catholic Book Blogger”. Interviewing Pete for our first interview is a bit odd because one of Pete’s weekly posts is an interview with a Catholic author! So we are amateurs compared to him! Pete’s blog is a gold mine for any one searching for good books to read about the Catholic faith. Pete posts a review every Thursday, a giveaway of the reviewed book on Friday which runs for one week, and an interview with the author of the book the following Monday. In addition to that, he posts The Clergy Speaks columns on Tuesdays. He also posts an excerpt from the book A Year with the Church Fathers each day. This is done through the cooperation of author Mike Aquilina and publisher Saint Benedict Press. When time allows he posts a New and Notables column which features upcoming titles which he feels may be interesting. Additionally, on Mondays, he may feature a CD from Lighthouse Catholic Media through his role as LHCM Account Manager. Whew! That’s one busy guy and so organized! Let’s start the interview and learn more about Pete, who he is, and what he’s been up to! Jennifer: How long have you been blogging? Pete: I began my blog in Nov. 2012 via self-hosting. In Oct. 2013 I was invited by Elizabeth Scalia, managing editor of the Patheos Catholic web portal to move my blog under their umbrella. My blog has been hosted there since. Jennifer: How do you help Catholics through your blog? Pete: My blog aids readers in selecting quality, enriching Catholic books that help them in their faith journey. Jennifer: How do you find time to blog? Pete: I am asked this question often and specifically how do I read so much so here goes. It’s a gift. I have always been an avid reader. In the summer of 2011 I was given a copy of Be A Man by Father Larry Richards. Admittedly up to that point I had been a lukewarm Catholic. That book changed my life (though has not made me perfect…you can verify that with my wife!). After reading the book I looked for a way to share the faith and decided to use my love of reading to serve the Church. Thus, The Catholic Book Blogger was born. Jennifer: Why is it important to find this time? Pete: I have made this work my form of evangelizing which we are all called to do. Jonathan: What have you learned through blogging? Pete: Simple….my faith. When I set out to provide guidance on good books little did I know how rewarding it would be for myself as well. There is a huge ocean of information out there if you take the time to access it and read. You would be amazed at the quantity of books I receive from publishers to review. The access I have to new and unreleased books affords me the opportunity to first and foremost educate myself. Though that may sound selfish it is a key step in evangelization…..education of self. Jennifer: What are your 3 favorite/most popular posts on your blog? Pete: Here goes: My sit down interview with Father Larry Richards was an absolute thrill for me. I had the opportunity of meeting him at a men’s retreat in 2013. Other interviews include Scott Hahn, Cardinal Donald Wuerl and Mike Aquilina. I’m really enjoying the responses I am getting from many Bishops in my recurring column The Clergy Speaks. Here is the first entry from Bishop Kevin Rhoades. I have multiple reviews that I am quite proud of including Strange Gods by Elizabeth Scalia, Camerado: I Give You My Hand by Maura Zagrans and Faith of Our Fathers by Mike Aquilina. Jonathan: What do you have in the works? Share a sneak peek of an up-coming post or event. Pete: I have a huge project in the works right now that will team me up with someone I have great respect for. It has the potential of being something the church has never seen before…unfortunately….we are not quite ready to announce it so keep your eyes open. One thing I can talk about in depth is my weekly “The Clergy Speaks” column. I have been getting amazing feedback and the willingness of many clergy to participate in the simple one question feature. “What 5 books would you recommend as must reads for Catholics today?” It’s really exciting for me to share what our Bishops, Cardinals and well known priests are coming up with each week. In a few weeks I will be launching the companion column to “The Clergy Speaks” which will be called “The Laity Speaks”. It will comprise the same question but posed to prominent members of the laity. There are some other things in the works as well but suffice it to say 2015 will be an exciting year at CBB. Jennifer: List your three favorite Catholic blogs or resource websites? Pete: I humbly submit the Patheos Catholic Portal. We have some great writers over there including Deacon Greg Kandra, Father Dwight Longenecker, Elizabeth Scalia and Simcha Fisher. Jennifer: What are some things that few people know about you? Pete: Well first that the creator of Catholic Inspired (Jen Lawrence) is my sister-in -law. Second I am coordinating retreats at my local parish for the parish, deanery, and diocese as a whole. In 2013 Mike Aquilina came to town, Scott Hahn was here this August and next year Donna-Marie Cooper O’Boyle and Matt Leonard are coming. Third, I’m a convert to the Catholic faith and I joined the church in 1996. Jennifer: What do you love most about being Catholic? Pete: The part that excites me most about the Catholic faith is our history. We have an unbroken chain back to Christ himself. One area I have delved into the past two years is the Church Fathers. If you have not spent time with the writings of the Church Fathers you are doing yourself a huge dis-service. I cannot recommend enough the multitude of fine books patristic expert Mike Aquilina has written. Jennifer: Who would you most like to meet in Heaven and what would you ask or say to them? Pete: There’s a loaded question! I’ll put it this way. If I am privileged to make it to Heaven I would be happy to be in the presence of the Holy ones that arrived before me. Jennifer: Who is your favorite saint and why? Pete: I have always been drawn to Padre Pio. What a fascinating, holy person with some absolutely incredible gifts! We cannot forget one of our newest Saints our beloved Pope John Paul II. I think we are only just learning the magnitude of the love he had for his flock. Jonathan: Most of us only get to know writers by their books but since you speak to them on a more personal level, what are your personal feelings about Catholic writers, in general? Pete: Catholic authors are an amazing bunch. In the 2 years of reviews and interviews at CBB I have formed many friendships. Mike Aquilina was the first author I interviewed. He is one of the most humble men I know and will take no credit for what I am about to say. He has been a tremendous sounding board throughout these 2 years of blogging. I treasure his friendship and owe him much. I came to know Maura Zagrans while working on an interview with her for her book Camerado: I Give You My Hand. She is a delightful person with a refreshingly free-spirit that has been a great support as well. My buddy Matt Leonard will be coming to New Oxford to speak in 2015. This guy has pulled me through on a number of looming deadlines. Then there is The Anchoress, Elizabeth Scalia. She took a relatively unknown, one year blogger (yeah I’m talking about me) and brought him on board the largest Catholic portal on the web at Patheos. She took a chance on me and I am forever grateful to her. These are just a few examples of Catholic authors and the great bunch they are. Every author I have had the pleasure to either exchange emails or phone calls with is the same. Genuine, caring and willing to help however they can. Not only do they write about Catholicism, they openly practice it in their interactions. Jonathan: Why do you feel the work of Catholic writers today is so important? Pete: Because they are answering the call of the New Evangelization. They are producing books that are educational in the faith and inspiring in practice. They are providing a much needed resource for a world that has greatly fallen away. In recent years there has been a resurgence in Catholic books being published. I think there are two reasons for this. First there is a genuine need for enriching material. People are buying and publishers are responding. Second, as I stated earlier, the call of the New Evangelization is being answered. The bell was rung during Vatican II, Pope John Paul II made it a hallmark of his pontificate. Pope Benediction XVI continued to promote it. I think now we are just beginning to see the New Evangelization take shape and reach its potential. Jonathan: Looking at the times we live in, have you seen any works that are uniquely helpful for average Catholics today? Pete: As I mentioned in the previous question there is a real resurgence in Catholic material being printed the past few years. There are some really fantastic books I can point out as recommendations. I’ll approach this as my own five must reads. Be A Man by Father Larry Richards. find my sit down interview with Father Larry here. Christians Still Matter and Always Will by my good friend Mike Aquilina. one and more recent ones. with Scott on this book here. David’s story is incredible and what is even more incredible is his work. Read the review here and interview with Maura here. needed. Cardinal Wuerl gives people a refresher on the sacrament in this book. interview I did with the Cardinal here. Kathleen Beckman. My Battle Against Hilter by Dietrich Von Hildebrand. Brandon Vogt. These are just a few of the many titles on the pile currently! Jennifer: Since interviewing Catholic writers is a major part of your blog, how has it felt being on the flip side of the interviewing table? Pete: Much more difficult than I thought it would be! Seriously though, I enjoyed the interview. Great questions and thanks for taking the time to ask. I enjoy sharing my work and hope readers find it of benefit to them on their spiritual journeys. Jennifer and Jonathan: Thank you, Pete, for your time and all of your efforts to inform us about all of the wonderful Catholic literature that is available! Jennifer and Jonathan have been married for 17 years and they have 9 children (ages 16 to 3), who they home-educate in Pennsylvania. Jennifer blogs about the faith and creative ways to share it at home and school at Catholic Inspired. Better late than never: Big Clicks Awards for SEPTEMBER!